On Saturday (15th October) I was back in Brighton for the first time since I left my job there at the end of July. The occasion was a very nice lunch party to celebrate 50 years of the Astronomy Centre at the University of Sussex, which started properly in 1966. It was a pleasant occasion, and great to have the chance to catch up with some people I haven’t seen for far too long. I had two stints in the Astronomy Centre: once as a student then postdoc from 1985 to 1990, and the other from 2013 to 2016 when I was Head of the School of which the Astronomy Centre is part. I had a lot more time to do research in the first incarnation than in the second! Quite a few people present hadn’t realised I was no longer working at Sussex, which led to one or two slightly awkward conversations, but I was thankfully very far from being the centre of attention. After the lunch itself we had short speeches from various alumni of the Astronomy Centre: esteemed science writer John Gribbbin (who was one of its first MSc students in 1966); Lord Martin Rees (who was briefly a Professor at Sussex, before he returned to Cambridge to take up the Plumian Professorship); John Barrow (who was my supervisor while I was there); Carlos Frenk (who was a postdoctoral researcher when I arrived in September 1985, but who left to take up a lectureship in Durham at the end of that year so we overlapped only for a short time); Andrew Liddle (who arrived near the end of my stay and was there for 22 years altogether, leaving at the end of 2012 to take up a post in Edinburgh); and Peter Thomas (current Director of the Astronomy Centre). When I arrived in 1985 there were only four permanent faculty in the Astronomy Centre itself – Roger Tayler, Leon Mestel, John Barrow and Robert Smith – but research there was thriving and it was a great environment to work in. I count myself very lucky at having made such a good choice of a place to do my PhD DPhil. Leon and Robert both worked on stellar astrophysics, but after Leon’s retirement the centre increasingly focussed on cosmology and extragalactic astrophysics, which remains the case today. Roger Tayler sadly passed away in 1997, but Leon is still around: he is 89 years old and now lives in Cambridge. Those present at the lunch were given a booklet featuring around 50 academic papers or other research “highlights”(e.g. the launch of Planck), approximately one for each year of the Astronomy Centre, chosen to be the “best” of that year. Each page was also shown as a slide during the lunch. I was thrilled to see that two of my papers (from 1987 and 1991 respectively) made it into the collection. The second one was published after I’d left Sussex, but I definitely did the work on it and submitted it while an employee of the Astronomy Centre. Andrew Liddle and John Barrow have the largest number of “greatest hits”, but the most famous paper is probably the classic “DEFW” which won Carlos Frenk and his collaborators the Gruber Prize about five years ago. The book also contains various bits of interesting bibliometric information, such as this, which shows that the variation in the productivity of the Astronomy Centre over time. Thanks to Seb Oliver and the rest of the Astronomy Centre for organizing this very enjoyable event – and for sending me the slides! 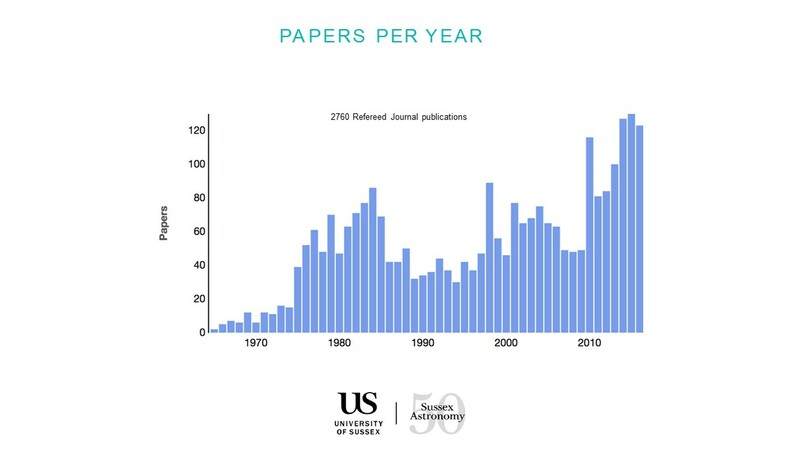 Here’s to the next 50 years of Astronomy at the University of Sussex! Last week a piece appeared on the Grauniad website by Henry Gee who is a Senior Editor at the magazine Nature. I was prepared to get a bit snarky about the article when I saw the title, as it reminded me of an old rant about science being just a kind of religion by Simon Jenkins that got me quite annoyed a few years ago. Henry Gee’s article, however, is actually rather more coherent than that and not really deserving of some of the invective being flung at it. One thing that never gets emphasised enough in science, or in schools, or anywhere else, is that no matter how fancy-schmancy your statistical technique, the output is always a probability level (a P-value), the “significance” of which is left for you to judge – based on nothing more concrete or substantive than a feeling, based on the imponderables of personal or shared experience. Statistics, and therefore science, can only advise on probability – they cannot determine The Truth. And Truth, with a capital T, is forever just beyond one’s grasp. But the main thing that bothers me about Gee’s article is that he blames scientists for promulgating the myth of “science-as-religion”. I don’t think that’s fair at all. Most scientists I know are perfectly well aware of the limitations of what they do. It’s really the media that want to portray everything in simple black and white terms. Some scientists play along, of course, as I comment upon below, but most of us are not priests but pragmatatists. Anyway, this episode gives me the excuse to point out that I ended a book I wrote in 1998 with a discussion of the image of science as a kind of priesthood which it seems apt to repeat here. The book was about the famous eclipse expedition of 1919 that provided some degree of experimental confirmation of Einstein’s general theory of relativity and which I blogged about at some length last year, on its 90th anniversary. I decided to post the last few paragraphs here to show that I do think there is a valuable point to be made out of the scientist-as-priest idea. It’s to do with the responsibility scientists have to be honest about the limitations of their research and the uncertainties that surround any new discovery. Science has done great things for humanity, but it is fallible. Too many scientists are too certain about things that are far from proven. This can be damaging to science itself, as well as to the public perception of it. Bandwagons proliferate, stifling original ideas and leading to the construction of self-serving cartels. This is a fertile environment for conspiracy theories to flourish. To my mind the thing that really separates science from religion is that science is an investigative process, not a collection of truths. Each answer simply opens up more questions. The public tends to see science as a collection of “facts” rather than a process of investigation. The scientific method has taught us a great deal about the way our Universe works, not through the exercise of blind faith but through the painstaking interplay of theory, experiment and observation. Science does not deal with ‘rights’ and ‘wrongs’. It deals instead with descriptions of reality that are either ‘useful’ or ‘not useful’. Newton’s theory of gravity was not shown to be ‘wrong’ by the eclipse expedition. It was merely shown that there were some phenomena it could not describe, and for which a more sophisticated theory was required. But Newton’s theory still yields perfectly reliable predictions in many situations, including, for example, the timing of total solar eclipses. When a theory is shown to be useful in a wide range of situations, it becomes part of our standard model of the world. But this doesn’t make it true, because we will never know whether future experiments may supersede it. It may well be the case that physical situations will be found where general relativity is supplanted by another theory of gravity. Indeed, physicists already know that Einstein’s theory breaks down when matter is so dense that quantum effects become important. Einstein himself realised that this would probably happen to his theory. Putting together the material for this book, I was struck by the many parallels between the events of 1919 and coverage of similar topics in the newspapers of 1999. One of the hot topics for the media in January 1999, for example, has been the discovery by an international team of astronomers that distant exploding stars called supernovae are much fainter than had been predicted. To cut a long story short, this means that these objects are thought to be much further away than expected. The inference then is that not only is the Universe expanding, but it is doing so at a faster and faster rate as time passes. In other words, the Universe is accelerating. The only way that modern theories can account for this acceleration is to suggest that there is an additional source of energy pervading the very vacuum of space. These observations therefore hold profound implications for fundamental physics. As always seems to be the case, the press present these observations as bald facts. As an astrophysicist, I know very well that they are far from unchallenged by the astronomical community. Lively debates about these results occur regularly at scientific meetings, and their status is far from established. In fact, only a year or two ago, precisely the same team was arguing for exactly the opposite conclusion based on their earlier data. But the media don’t seem to like representing science the way it actually is, as an arena in which ideas are vigorously debated and each result is presented with caveats and careful analysis of possible error. They prefer instead to portray scientists as priests, laying down the law without equivocation. The more esoteric the theory, the further it is beyond the grasp of the non-specialist, the more exalted is the priest. It is not that the public want to know – they want not to know but to believe. Things seem to have been the same in 1919. Although the results from Sobral and Principe had then not received independent confirmation from other experiments, just as the new supernova experiments have not, they were still presented to the public at large as being definitive proof of something very profound. That the eclipse measurements later received confirmation is not the point. This kind of reporting can elevate scientists, at least temporarily, to the priesthood, but does nothing to bridge the ever-widening gap between what scientists do and what the public think they do. As we enter a new Millennium, science continues to expand into areas still further beyond the comprehension of the general public. Particle physicists want to understand the structure of matter on tinier and tinier scales of length and time. Astronomers want to know how stars, galaxies and life itself came into being. But not only is the theoretical ambition of science getting bigger. Experimental tests of modern particle theories require methods capable of probing objects a tiny fraction of the size of the nucleus of an atom. With devices such as the Hubble Space Telescope, astronomers can gather light that comes from sources so distant that it has taken most of the age of the Universe to reach us from them. But extending these experimental methods still further will require yet more money to be spent. At the same time that science reaches further and further beyond the general public, the more it relies on their taxes. Many modern scientists themselves play a dangerous game with the truth, pushing their results one-sidedly into the media as part of the cut-throat battle for a share of scarce research funding. There may be short-term rewards, in grants and TV appearances, but in the long run the impact on the relationship between science and society can only be bad. The public responded to Einstein with unqualified admiration, but Big Science later gave the world nuclear weapons. The distorted image of scientist-as-priest is likely to lead only to alienation and further loss of public respect. Science is not a religion, and should not pretend to be one. PS. You will note that I was voicing doubts about the interpretation of the early results from supernovae in 1998 that suggested the universe might be accelerating and that dark energy might be the reason for its behaviour. Although more evidence supporting this interpretation has since emerged from WMAP and other sources, I remain sceptical that we cosmologists are on the right track about this. Don’t get me wrong – I think the standard cosmological model is the best working hypothesis we have _ I just think we’re probably missing some important pieces of the puzzle. I don’t apologise for that. I think sceptical is what a scientist should be. So the glorious weather continues. Unfortunately, unlike most UK universities, we’re not finished for Easter yet; at Cardiff University we only get three weeks for the Easter recess instead of the four that colleagues over the border seem to enjoy. 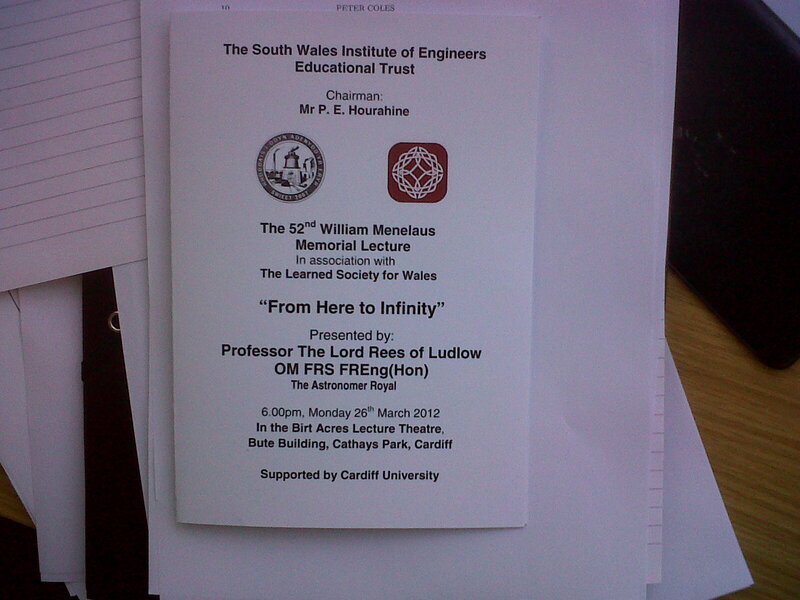 One of the consequences of this is that the annual National Astronomy Meeting (NAM) often falls in Cardiff term time. This year NAM is taking place in the fine city of Manchester (which, for those of you unfamiliar with British geography, is in the Midlands). Many colleagues in the School of Physics & Astronomy are attending NAM, and most of my research group are either there already or travelling up today. I particularly wish Jo and Ian well when they give their talks; one of the excellent things about NAM is the opportunity it offers for younger researchers to talk about their work to a large audience. Nerve-wracking, no doubt, but invaluable experience. I’m not going to NAM this year because I have too much to do back here at the ranch, including filling in a few lectures for staff who are away. I’m always reluctant to cancel lectures during term-time, but in the current spell of good weather I doubt if any students would complain too much! 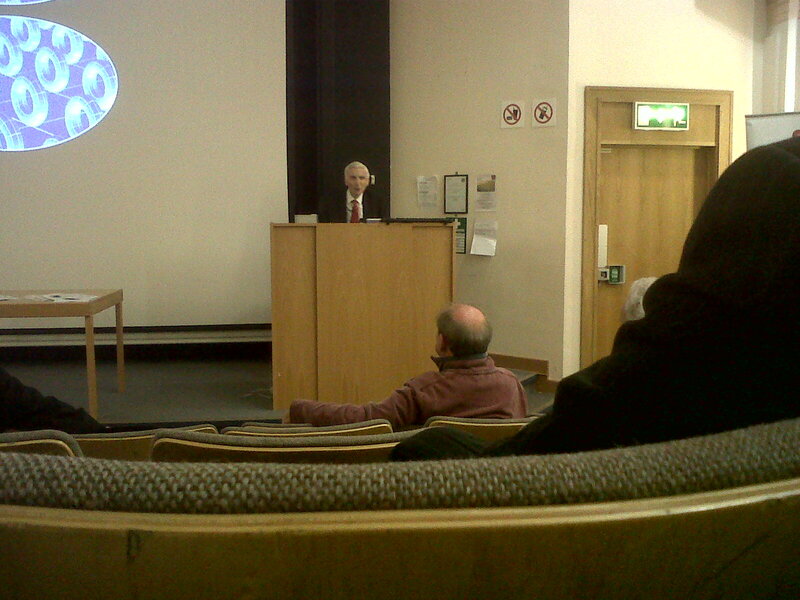 I did a cosmology lecture this morning – only the second I’ve done here – and it the room was uncomfortably stuffy. A few of the students failed to fall asleep, however, so I regard that as a major success. You’ll see that this is organized “in association with The Learned Society for Wales“, which I only just learned about when I saw it on the invitation! Anyway, the prospect of a slap-up dinner persuaded me to just have a sandwich for lunch. Now that’s eaten methinks I’ll get back to work! Science today must search for a source of inspiration higher than itself or it must perish. Science offers only three points of interest: 1. technical applications; 2. as a game of chess; 3. as a way to God. I’m not sure I agree with what is written, and in any case the options don’t seem to me to be mutually exclusive, but a number of things did strike me reading it. For a start, and for what it’s worth, I do think science has value within itself, so I’m at odds a bit with the initial premise. On the other hand, science is a human activity and it therefore doesn’t stand apart from other thing humans are interested in. Then there is the extent to which we now all have to pretend that pretty much the only point of interest in science is “1. technical applications”. I don’t believe that’s true, actually, and I’m worried that by continually saying that it is, scientists might be sowing the seeds of their own destruction. One of the interesting things about working in cosmology is that the big questions are very big indeed, which may be the reason why cosmologists tend to have strong views on matters of religion (and metaphysics in a general sense). Just take the Templeton Prize, for example. The arguments about this year’s award to Lord (Martin) Rees are still simmering on, but it’s worth remembering that many recent winners of this prize, including John Barrow (my PhD supervisor, in fact) and George Ellis (former collaborator of mine), are most noted for their work in cosmology. Both are religious: John Barrow is a member of the United Reformed Church, and George Ellis is a Quaker. Martin Rees is an atheist. But their religious views are not in conflict with their research. All are outstanding scientists. I’ve been thinking a lot over the Easter holiday about religion and science. It’s partly the Templeton prize saga, partly the occasion of Easter itself, and partly the fact that I’ve been reading even more of the poems of R.S. Thomas. In case you didn’t know I was brought up in the (Anglican) Christian tradition, attended Sunday School, sang in the local Church Choir, and was confirmed in the Church of England. When I went to seconday school – the Royal Grammar School, Newcastle – I joined the Christian Union and remained in it for 3-4 years. However, although I became an atheist I’ve never been a particularly devout one. The only thing that I’m really sure about is that I don’t know the answers. Does that make me an agnostic rather than an atheist? I don’t know. Perhaps I could just describe myself as a non-believer? That wouldn’t do either, because we all have to believe in some things in order to function at all. Even science starts with unprovable axioms. A career in cosmology has given me the opportunity to think about many Big Questions. Why does the Universe have laws? Why is there something rather than nothing? And so on. I’m not much of a philosopher, though, and I don’t have the answers. I do, however, refuse to take the easy way out by denying that the questions have meaning. Of course it’s not entirely satisfactory having to answer “I don’t know”, but I don’t agree with those of my atheist colleagues who think religion is an easy way out. I’m sure that a thinking Christian has just as many difficult issues to grapple with as a thinking atheist. Not thinking at all is the only really easy way out. I thought it was an interesting dialogue, but I have to say that, if anything, it strengthened my non-belief. 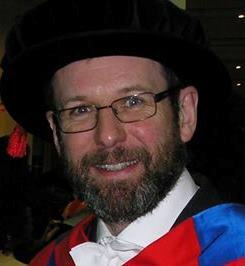 Prof. Keith Ward argued that the primary motivation for belief in God was the existence of “Good”. I have to admit that I find the Universe as a whole amoral and although humans have done good from time to time they have done evil in at least equal measure. The vast majority of people on this Earth live in poverty, many of them in abject misery. Good is a bad word to describe this state of affairs. I just can’t accept the idea of a God that is interested in the Universe at the level of human beings. We’re so insignificant on the scale of the cosmos, that it seems very arrogant to me to suppose that it’s really got much to do with us. We appeared somehow, miraculously perhaps, but could disappear just as easily. I doubt the Universe would miss us much. Reading through an interesting blog post about the new results from Planck by the ever-reliable Jonathan Amos (the BBC’s very own “spaceman”), I was reminded of a comment I heard made by Martin Rees (now Lord Rees) many years ago. The remark concerned the difference between cosmology and astrophysics. Cosmology, said Lord Rees, especially the part of it that concerns the very early Universe, involves abstract mathematical concepts, difficult yet logical reasoning and the ability to see deep things in complicated spatial patterns. In that respect it’s rather like chess. Astrophysics, on the other hand, which is not at all elegant and has so many messy complications that it is sometimes difficult even to work out what is going on or what the rules are, is more like mud wrestling. The following image, which I borrowed from Jonathan Amos’ piece, explains why I was reminded of this and why some cosmologists are having to abandon chess for mud wrestling, at least for the time being. The picture shows the nine individual frequency maps (spanning the range from 30 GHz to 857 GHz) obtained by Planck. What we cosmologists really want to see is a pristine map of the cosmic microwave background, the black-body radiation that pervades the entire Universe. It’s black body form means that it would have the same brightness temperature across all frequencies, and would also be statistically homogeneous (i.e. looking roughly the same all across the sky). What you actually see is a mess. There are strong contributions from the disk of our own Galaxy, some of it extending quite a way above and below the plane of the Milky Way. You can also see complicated residuals produced by the way Planck scans the sky. On top of that there is radiation from individual sources within our Galaxy, other Galaxies and even clusters of Galaxies (which I mentioned a couple of days ago). These “contaminants” constitute valuable raw material for astronomers of various sorts, but for cosmologists they are an unwanted nuisance. Unfortunately, there is no other way to reach the jewels of the CMB than by hacking through this daunting jungle of foregrounds and instrumental artefacts. Looking at the picture might induce one of two reactions. One would be to assume that there’s no way that all the crud can be removed with sufficient accuracy and precision to do cosmology with what’s left. Another is to appreciate how well cosmologists have done with previous datasets, especially WMAP, have confidence that they’ll solve the numerous problems associated with the Planck data, but understand why will take another two years of high-powered data analysis by a very large number of very bright people to extract cosmological results from Planck. With the reaction to Simon Jenkins’ rant about science being just a kind of religion gradually abating, I suddenly remembered that I ended a book I wrote in 1998 with a discussion of the image of science as a kind of priesthood. The book was about the famous eclipse expedition of 1919 that provided some degree of experimental confirmation of Einstein’s general theory of relativity and which I blogged about at some length last year, on its 90th anniversary. I decided to post the last few paragraphs here to show that I do think there is a valuable point that Simon Jenkins could have made out of the scientist-as-priest idea. It’s to do with the responsibility scientists have to be honest about the limitations of their research and the uncertainties that surround any new discovery. Science has done great things for humanity, but it is fallible. Too many scientists are too certain about things that are far from proven. This can be damaging to science itself, as well as to the public perception of it. Bandwagons proliferate, stifling original ideas and leading to the construction of self-serving cartels. This is a fertile environment for conspiracy theories to flourish. PS. You will note that I was voicing doubts about the interpretation of the early results from supernovae in 1998 that suggested the universe might be accelerating and that dark energy might be the reason for its behaviour. Although more evidence supporting this interpretation has since emerged from WMAP and other sources, I remain skeptical that we cosmologists are on the right track about this. Don’t get me wrong – I think the standard cosmological model is the best working hypothesis we have _ I just think we’re probably missing some important pieces of the puzzle. I don’t apologise for that. I think skeptical is what a scientist should be.